“Remix Your Learning Experience Design Process” was the second workshop in the three-part Ready GO! summit at SXSWedu this year. This workshop was designed to support participants in thinking through a process that innovative teachers might go through to re-design lessons or units–“learning experiences”–to support deeper student learning. Martin Moran, at the Francis W Parker School in Chicago, and I worked together to hammer out this workshop, and in the process really thought through how we go through learning experience redesign ourselves. My students have choice in the learning process and deliverable. My students know the purpose and context of learning experiences from the beginning. My students confront and design for other perspectives and needs. My students directly interact with the content and directly practice the skills at the heart of the learning experience. My students problem-solve and design towards their learning goals (adaptive expertise). Learning experiences have no single “right” answer, and solutions require significant sustained effort by my students. Learning experiences include appropriate scaffolding for my students to be successful with appropriate challenge and perseverance. My students contribute to the plan for assessment. My students collaborate to solve problems as a team. My students reflect, revise, iterate, and can identify and describe their own learning pathways (metacognition). Having identified these 10 “core elements,” we then pieced apart a few of our own examples to see whether there was a pattern in how our redesign process took place… How did we take existing learning experiences and redesign them to increase each of those 10 core elements? I used an example of a redesign I conducted with my kindergarten colleagues for a weather unit, as well as an example with my 7th grade social studies colleagues on a unit about the antebellum era of American history. History: Kindergarten has done a unit on weather for a long time. With our new makerspace, they wanted to move a major activity–building a wind sock–into the makerspace. Yes direct & meaningful interaction with content. No student choice, no student design, single right answer, no opportunity for iteration. Purpose: Other aspects of weather (amount of rain, temperature) are easy to see, measure, and describe. Need to find a more concrete way to see, measure, and describe wind. Back up from task to learning goal. Problem: The problem is that wind is hard to measure–shift to students finding the solution: invent and test a wind measurer. What is the problem, from student’s point of view? Can the student solve the problem? Materials: Broad enough selection of materials for very open-ended design. Emphasizes that there is no single right answer. Final Reflection: Draw and write what you changed to make it better. Assessment focuses on iterative aspect. Engaging, but with none of the “core elements” of innovative learning. Don’t try to jump straight to a new task–fully establish the learning goal. What are the ways to visualize these intersections? What are the similarities to other events? What are the “What If?” s ? What if X event outcome were different? What problems could be solved? Selected Favorite: What If X happened differently? Assign the whole class to analyze one specific change? Too restrictive. Wide open, choose any single event change? Too little scaffolding, not guaranteed to meet learning goal. Offer choice of themes (technology, women’s rights movement, abolitionist movement, etc), students choose one change within that theme and relate to downstream and ultimately Civil War outcome. Just right. Appropriate scaffolding, student choice, no “right” answer, significant grappling with the content. *This “different ways of tackling the problem” can look like magic to teachers with less practice in PBL, design thinking or other “innovative” learning experience designs. More on that below. Ultimately, these two examples show very important similarities and a distinct design thinking bent to the learning experience redesign process I’ve been using. As mentioned above, step #3 seems to be the step that feels the most like “magic” to many teachers who have less experience with redesigning their learning experiences through a student-driving-the-learning lens. I had come to begin thinking of my own brainstorming as sort of sifting through a hidden subconscious library, and I really wanted to make that library more visible. I tried to start defining categories for my hidden library, thinking through as many examples as possible from the projects I’ve redesigned with my colleagues over the past two years. 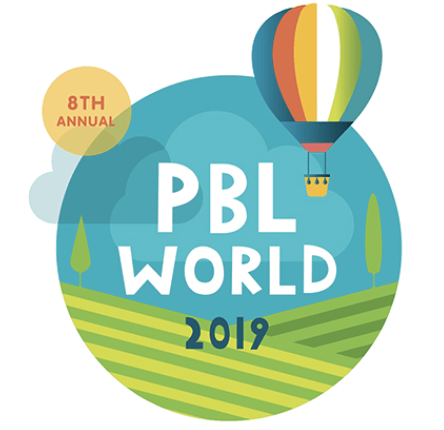 In addition to our own examples, I sifted through this giant amazing list of PBL prompts, to try to ensure I covered a wide variety of ways of tackling content. This feels quite aligned to a Bloom’s Taxonomy style of categorization, and if Bloom’s is a categorization of depth of knowledge or thinking, perhaps this library could be a categorization of depth of grappling with content. Perhaps it’s just a more specific action-based organization of Bloom’s? In any case, so far it has felt quite useful. To test these categories, I took three more examples of projects redesigned with my colleagues and tried to brainstorm valid, exciting, students-driving-the-learning project prompts in the other categories. Answer: The development of what technology had the greatest impact on a civilization’s success? How would (x civilization) have been different with (x difference in local environment)? How would (x plant’s) seed dispersal mechanism have adapted differently if (x env characteristic) were different? Finally, adjust on the fly and take notes for future years (iterate). Give yourself time to build up and deepen your library, and recognize projects across all ages and subject areas as potential sources of inspiration for your own classroom. And finally, as we emphasized in the workshop itself: allow your expertise to vary across the different core elements of innovative learning experiences, and seek out support from teachers whose expertise is in different areas. When we presented the core elements in the session, we asked participants to self-assess themselves in the elements where they feel most confident and the elements where they feel least confident. So few participants felt confident in supporting students in contributing to the plans for assessment, and in developing learning experiences with no single “right” answer–those are hard!